With Christmas fast approaching, what better time than now to share my little collection with you. Having the luxury of working at the coolest place on the planet (Retro Planet), collecting is second nature to me. 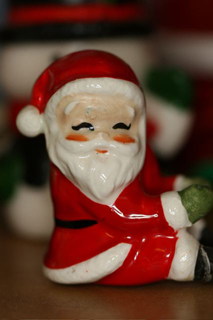 I have lots of little collections, but my favorite is by far my Vintage Santa display. Tucked in the corner of my office and displayed in a beautiful Heywood Wakefield corner cupboard, it brings a smile to my face every day. 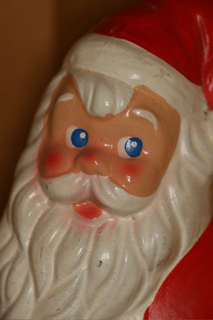 What started with a couple of vintage Santa’s from my Aunt’s attic, and many gifts from friends and family, has snowballed into 50 plus pieces. 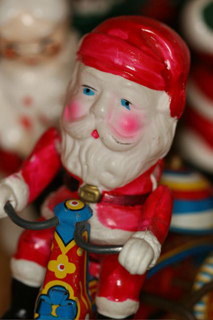 There are little Santas, big Santas and lots in between from salt and pepper shakers to a vintage St. Nick snow globe. Today it is snowing so they are in their element, but I proudly show them off year round. You can find them at yard sales, antique shops and they are plentiful on ebay. Be sure to let your friends and family know, as sometimes these little treasures are tucked away and replaced with new decorations. Happy Retro Collecting and Merry Christmas!